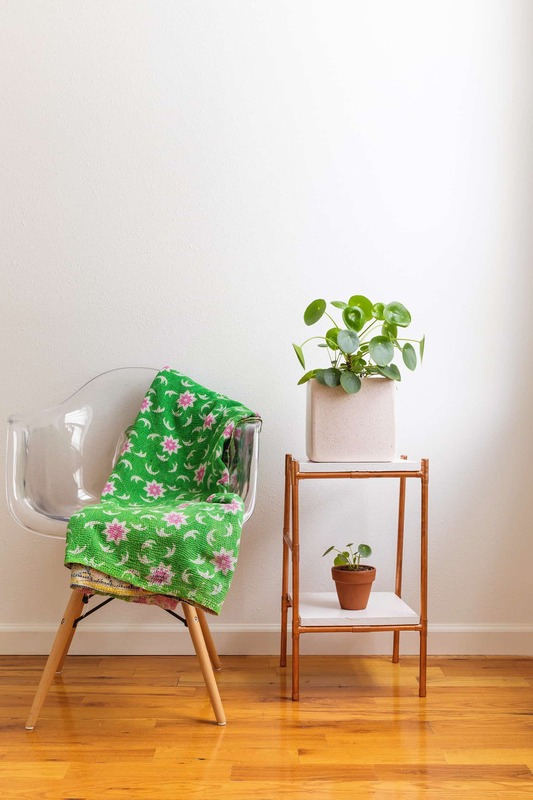 The Pilea Peperomioides, also known as the Pilea (Pie-lee-uh), the friendship plant (or the Chinese money plant) is a true gem. It’s playful, very pleasing to the eye, and fairly easy to care for. The plant grows like crazy and then grows little babies so you can share it with friends! Each time I look at mine, I can’t help but smile. Their quirky form is like no other plant. 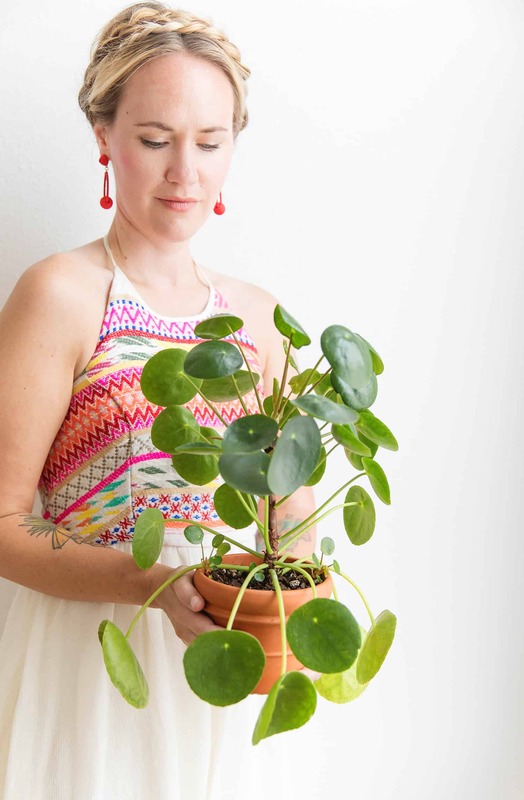 Potting: I find that repotting a Pilea can really encourage growth. Giving it some wiggle room will encourage the pups to spread out. To help prevent root rot, use a pot with a drainage hole. If you have a pot that you love and it doesn’t have a hole, then these drill bits are great for drilling a hole on the bottom of an earthenware pot. I love the trusty terra cotta pot that you can purchase at your local hardware store or greenhouse. They are utilitarian and simple. The terra cotta is excellent because it is a natural clay and will let the soil breathe a bit, unlike a plastic pot. 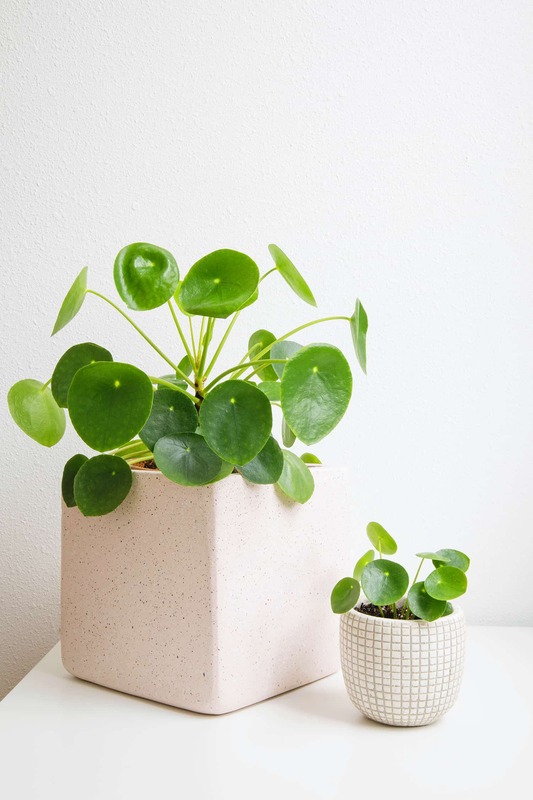 Don’t get me wrong, you can use a plastic pot or a heavily glazed pot (that has a drainage hole), but if you accidentally overwater your Pilea the terra cotta will be more forgiving and it dries out a bit faster. 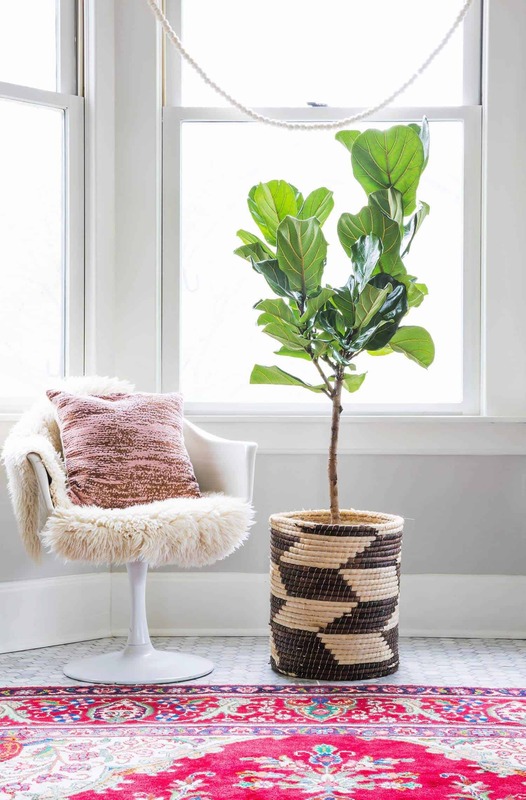 If you have a decorative pot that you love (I have some in the pictures), then simply stick your terra cotta pot inside your decorative one. I will take the terra cotta pot out of the decorative one for waterings, let it drain completely and then stick it back into the decorative pot. To repot your Pilea, pour some stones on the bottom (about 1-inch deep). The rocks aid with drainage and will help your plant not succumb to root rot. For soil, I use a quality, well draining potting mix. Your local greenhouse should have this or you can pick some up at your local hardware store. My mix has a bit of fine sand in it. We have some pretty humid months where I live (in southern Missouri), so the sand helps dry the plant out a bit faster. Watering: You have to water it moderately, but do not overwater it. 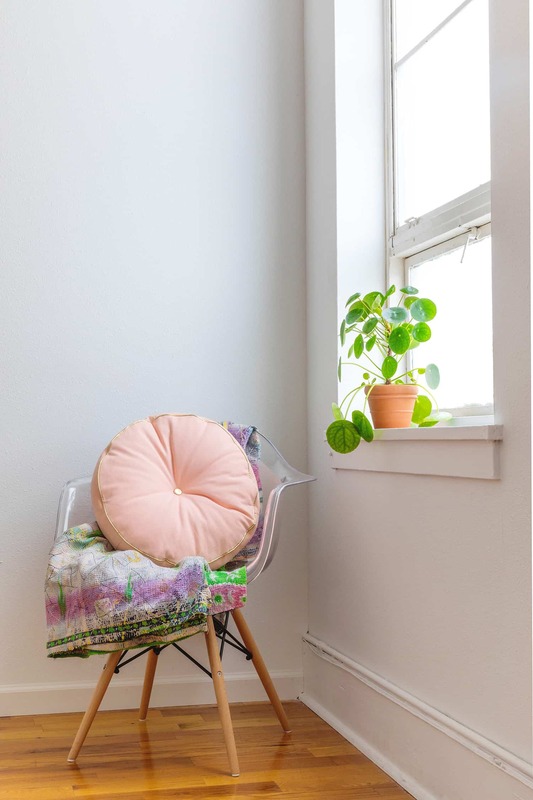 The Pilea likes to dry out in-between waterings and doesn’t like to stay soggy. I stick my finger in the dirt and also lift the pot to see if it still feels heavy from the last watering. If it feels dry to the touch, then I water it again. Let it dry out between waterings but be sure that it doesn’t get bone dry (although it is quite hardy and can handle it). I water mine on a weekly basis. If I check the plant and it still feels moist, then I wait a couple more days and check again. The other day, a friend texted me a picture of her Pilea which was drooping quite a bit. We came to the conclusion that it needed to be watered. It had dried out a bit too long! The plant will tell you what it needs and when it needs it, so just keep a watchful eye. I asked a local greenhouse about the Pilea and watering and they said one of the only ways to kill it is by overwatering. When you water your Pilea, never let it sit in water. Once you’ve watered it, make sure that you empty the excess water that catches in your bottom dish. If the dirt stays wet/soggy for too long, then the roots actually rot, which can likely lead to the death of the plant. I am prone to overwatering and it has taken me a good bit to rein in my need to “nurture” (aka overwater) the plant. Light: The Pilea loves the light! Bright indirect sunlight is what it needs. What does that mean? If you put your Pilea on your front porch with the sun beaming down on it, then that would be direct light and it will burn. Keep them indoors, near a bright window (which is indirect light). I put mine in the brightest window in my house and they love it. My mom had a Pilea on her dining room table (it was low light) and it started getting long and leggy (a very long middle stem with just a few branches). It was trying to reach for the light and looked like it wouldn’t make it much longer. She put it outside under her covered porch where it gets lot of indirect light and it is thriving again. It is no longer long and leggy! It is amazing how they adapt once you figure out what they need. I have run out of window space in the house and I’ve put some of my Pileas outside under a covered porch. They seem to love the summer air and are growing beautifully! As soon as the temperature starts to drop, then I will bring them back in. 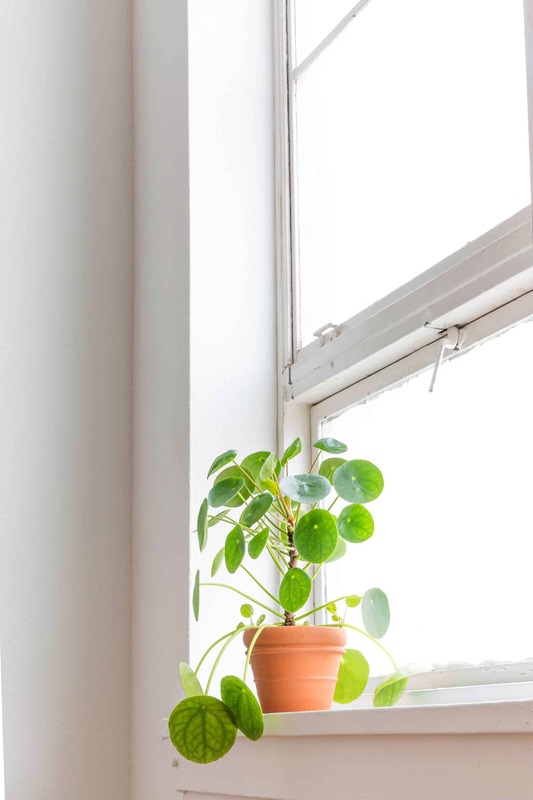 Another tip about lighting is that the Pilea will follow the light and start leaning towards it. It’s kind of funny to see them reaching for the window like they are trying to break free! I rotate mine each watering and that helps to keep them straight and balanced. Keeping the leaves dusted helps them get more light as well. Use a damp cloth and lightly rub off any dust to keep the leaves healthy and shiny. 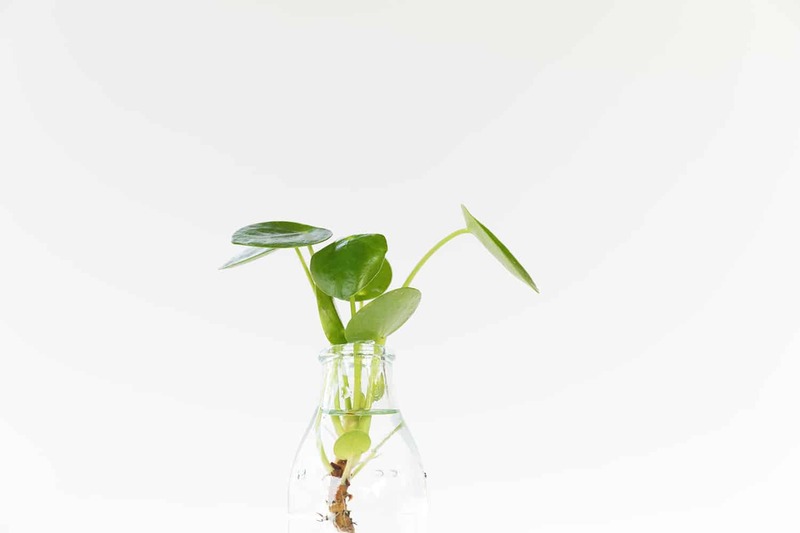 Propagating: One of the best parts of a Pilea plant is how fast it reproduces baby plants! 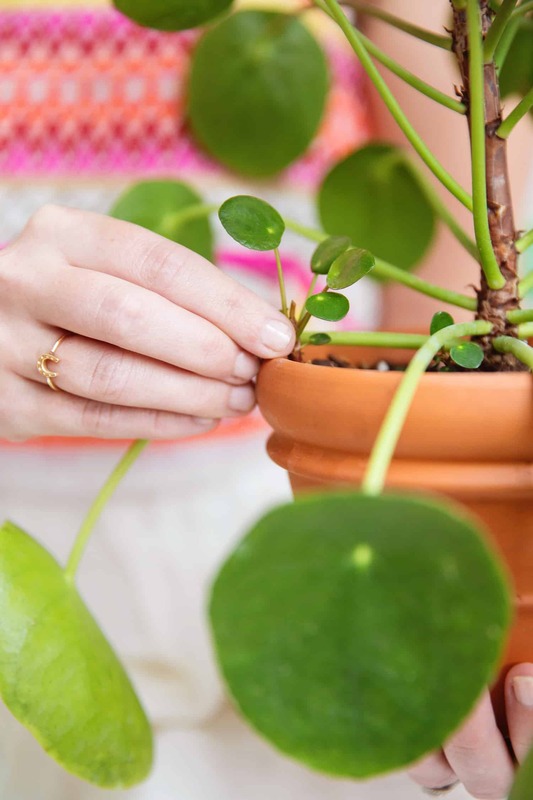 As your Pilea matures, little babies will pop out of the soil or grow from the stem (near the dirt). These babies are called “pups.” The pups actually grow from the root system and pop out of the dirt on top. When the pups start growing, you can either cut them off of the mother plant or let them grow. Letting them grow creates a full mother plant (which is beautiful)! I have a larger Pilea that I am trying to let grow and I avoid cutting off any pups. It’s crazy how fast and full they’ll grow when you don’t make any cuttings. I also have a Pilea that’s specifically for “sharing” that I will propagate and give to friends. 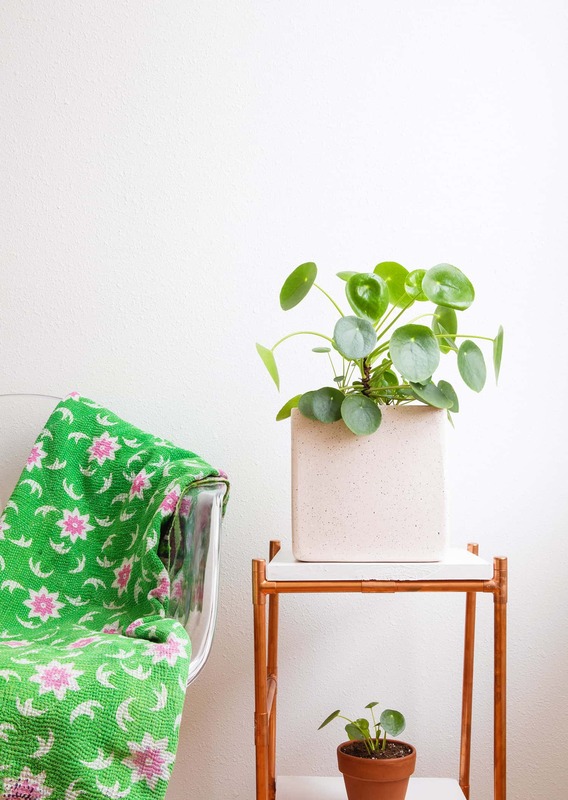 It’s more of your classic Pilea look with a single stem and shoots/branches growing out. I like to wait until the pup is at least 3 inches tall before I cut it. My favorite tool to use is an X-Acto knife (any sharp utensil should work though). Give your cutting utensil a good rinse before cutting into your Pilea. I once heard that you should think of pruning or propagating your plant like real surgery and always wash your tools beforehand. When you are ready to cut off a pup, be aware that the root system is very delicate. There is no need to tug or pull on the pup. Gently cut the pup where it meets the dirt and it should come right up. Once you have cut it off, you can either stick the pup in water or pot it in dirt. I prefer the water method because I like to see the roots growing through the glass. For best results, stick your little glass or vase in indirect but bright sunlight. Once you see some roots growing, then you can pot it. Fertilizing: If you want to give you plant an extra boost of growth, you can fertilize in the spring and summer months. There is some debate on fertilizer but I like to use a simple 10-10-10 formula. I use this fertilizer and love it. When I water, I pour a little liquid fertilizer into the watering can. Make sure you check the back of your fertilizer and follow the label instructions. I prefer a liquid fertilizer because it spreads evenly through the plant. I hope you all can can get your hands on this little plant. If you don’t have any in your city (yet! ), then a quick search online will bring up lots of online plant shops that carry them. If you are local to Springfield, Missouri, then Schaffitzel’s Flowers has the most Pilea plants in town. 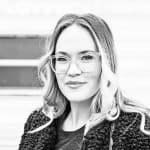 If you are into podcasts, this one called Bloom and Grow Radio is super informative and enjoyable! 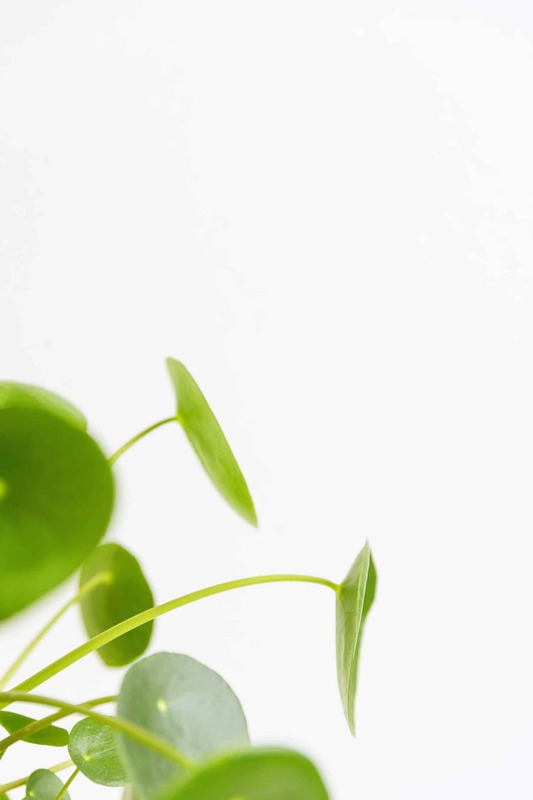 Be sure to leave a comment if you have any favorite tips or suggestions for caring for your Pilea! – Janae. I live in KC and just saw these at my favorite nursery! I’d never heard of them before and was nervous to try a new plant (I’m not known for my green thumb), but you’ve convinced me to give it a try! Which nursery in KC? I have been wanting one for several years!! I love this plant! I just bought one a couple of months ago, and am now trying to grow it’s first baby. In Dutch the common name for this plant is ‘pancake plant’, due to the shape of the leaves. And the name ‘Chinese money plant’ already mentioned here, is also derived from the round-shaped leaves (like coins). I have a few pilea plants right now and they’re quickly becoming my faves. Where is that square pot from? I love it! Mine just started getting some yellowing to the leaves… any ideas on why? Possibly over watering? That’s usually what yellow leaves mean. Wow I love this plant! How amazing that it’s only come over to the states in the last few years – that’s crazy! We think we already have things available to us. Thanks for sharing, I’ll have to keep an eye out for it the next time I’m at the plant store! That’s a really cute plant! Never heard of it before. I personally only have 3 plants at home right now (rather large ones) that are all at least 5 to 12 years old. I want to add more so I’m always looking for something interesting like this one. However my favourite plant is my ZZ plant. It is gorgeous and I need to report it soon as the roots are starting to stick out of the pot! If you don’t have one I highly recommend you look them up. I love these! I’d been searching for one for years and then found a bunch at my local Trader Joe’s (in MA)! I bought one as a housewarming gift and kept one for myself. I just got a pilea last month and I love it!! It’s adorable and super easy to care for. It even survived the horrible heatwave we had in So Cal. Please make these plant posts a regular feature!!! What a beautiful and quirky little plant, I have to get one! i just bought a pilea plant and my local nursery kindly sold me one of their four watermelon pilea, which is apparently very rare to find! it’s the same sort of care with the watermelon and the ordinary Pilea? I love this little plant. I live in South Florida and only collect plants that are “interesting” to look at- a large Devil’s Backbone, Brazilian Aurelia, night-blooming cereus, a 5′ wide Staghorn fern, and now my little pilea. It’s the 1st one I’ve ever seen. I can’t wait to have babies (so to speak)! Thanks for the info! Hello! Thanks for all the tips! I just got my hands on one! Do you use any fertilisers? Pistils nursery in Portland, OR has a fantastic website. 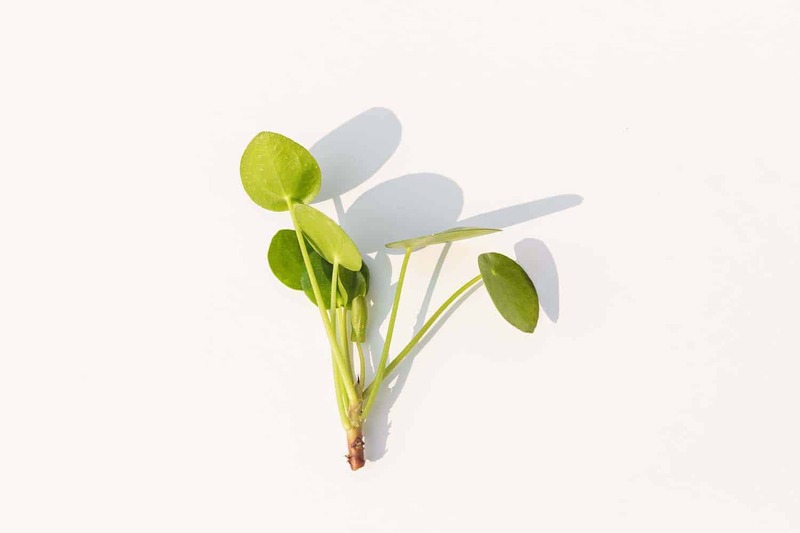 Besides their retail store in Portland, they have a fantastic web store, I live in Alaska and just had a FABULOUS Pilea delivered on 2/14/2019. There was a heat pad in the box. Temps were at 15 degrees up here (without the wind chill) and this baby was in perfect shape. Check them out! Patty, their store is so much fun to go into. I’m lucky to live in Portland. I bought a couple of pilea plants to give for Christmas and managed to take a pup from one for myself. It’s still tiny. I’m hoping it grows fast. 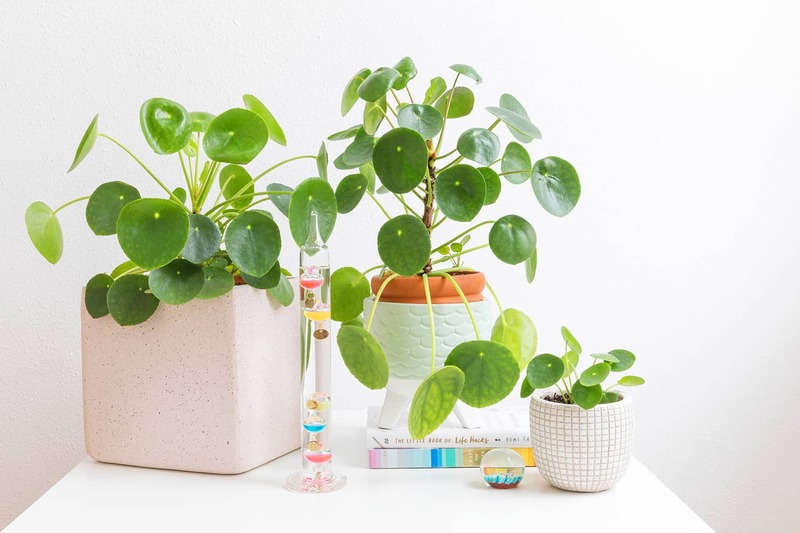 Best care tips I’ve found for the Pilea. Thank you!! Thanks for such a thorough and thoughtful guide for this quirky little plant. I just brought one home from Trader Joes — it looked so unusual and adorable. Looking forward to repotting it (as it came in a glazed pot without any drainage) and watchiing it propagate!